While in Hawaii I ran down to the beach to see a Ilio-holo-i-ka-uaua (that's a Hawaiian monk seal to all you mainlanders). The Hawaiian monk seals are one of the most endangered seals in the world, with less than 2,000 alive today. Anyway, one was hanging out at the beach and I wanted to see it. The kids were not particularly impressed. Z said -- with the detachment of some delphic oracle -- "It looks dead to me." And she was right that it looked that way. Krista took some pictures in which the seal appears to have expired on the beach, and the yellow tape put up to keep people from harassing the seal makes it look like a crime scene. It also meant that to get to the other side of the seal you had to wade through the surf to come up on the other side. Since I hadn't planned to run to the beach to see an endangered seal, I had carried my cell phone down with me. But, being a genius I knew to hold it in my hand so I could lift it up and over any waves that might crash upon me. As I passed around the edge of the crime scene tape I noticed two giant turtles in the surf. Which of course I needed to see more closely. So I walked closer and was amazed. They are incredible creatures. And then, as if in slow motion, a wave gathered strength and slapped me five right in the cell-phone-carrying hand. NOOOOOOOO! And it immediately shut down. It lost all signs of life. It looked, for all intents and purposes, precisely like a Hawaiian monk seal. I took out the battery, of course, and dried it out, and kept plugging it in to see if it would work. But no luck. Lights come on, but the screen is just a glowing blankness. It can send and receive phone calls... if it's plugged in. So it's now a land line, I guess. I feel completely crippled having a phone that you just pick up and dial in a number and make a call. One other issue... the phone was on vibrate at the time of the incident, and it won't switch over to audio. So that means that it's like a land line that only jiggles instead of ringing. I went to the Verizon cell phone people today and the guy asked me "Did you put it in a bowl of ice?" "A bowl of rice," he said. To pull the moisture out. Oh. Nope, didn't do that. So now it's too late. Phone = dead. I'm a year into my contract with no insurance so I can buy a "cheap" phone on a one year contract (cheap meaning only a hundred dollars instead of $150 or whatever the sale is today) or switch over to an old phone. So I switched back to my original phone. The one I had for four years. The one I dropped in a toilet and it still worked. The one that is so old it doesn't work with Bluetooth. 1) Does anyone have an old Verizon compatible phone they're trying to get rid of? Not as old as the one I am using right now, preferably. 2) Anyone out there use some sort of phone resale/buying site? One where I won't get ripped off? 3) Do you think it would be weird for me to stand outside the Verizon wireless store with a sign that said I WILL BUY YOUR OLD PHONE FOR $20 IF IT WORKS! We took an overnight flight home from Hawaii last night, which means we landed in LA before 5 and then dragged our way north to Oregon by ten or so. The kids wanted to go to school because they missed their friends, so I walked them down there. Z's class was having recess, and they came running toward the fence yelling, "Z's back! Z's back!" One little girl said, "We missed you, Z!" Another said, "Did you have fun in Hawaii?" A little boy asked, "Did you see any hot babes in bikinis?" I got a little writing time in this morning... long enough to finish chapter six in the new book. The writing goes fast when I take the time. But now I have to get ready to go sit by the pool. Last night Krista, her dad and I drove along the Waimea canyon and hit the top right as the sun was setting. It was gorgeous. On the way down through the Hawaiian dusk and near the end of our trip down from the canyon I saw some little animals on the road ahead... I thought maybe some small birds (there are mourning doves in abundance here). But no... it was hundreds of cane toads. They practically covered the road, it was like a plague of cane toads. I tried to miss them with the car as much as possible. One toad that I missed by driving directly over it jumped and hit the car's under carriage. Cane toads were introduced to Hawaii to eat beetles that were killing sugar cane. Then they started growing out of control. They have little poison sacs behind their eyes that kill predators that eat them, too, so they've been successful in killing more than just beetles. We jumped out of the car and took a couple of pictures of these monster toads. But you couldn't get too close or they would take a running start and then jump off the road. I know you, My Loyal Minions--who know much more about the internet than I-- say that there is no real mystery related to lame.org. But I just want to point out that today (Memorial Day) someone from Alpharetta, Georgia visited that page FIFTY-FOUR TIMES. I mean, I know some of you are Big Fans and like to visit often (which I heartily encourage), but even I must admit that's a little extreme. In fact, the precise page they visited was this one, which it looks like to me that maybe they were trying to hack my comments editor (?!). In addition, if I look up the Alpharetta, GA visitor on a map function for the stats it shows their location off the west coast of Africa. Huh? Okay, okay... this person also came referred from my facebook page... so they are probably reading this right now. REVEAL YOURSELF O PERSON FROM ALPHARETTA! Yes, even hackers are welcome here (yes, even you, Mister Uno). As for you minions, I have the person's ip address, so I can email it to you and then you can do your Internet Voodoo and tell me again how there's no mystery! You may have noticed the four posts below from my lovely wife, Krista. I had used her computer the other day so when she signed on to do her blog it posted to BHR instead! I've copied the content to her blog, now, and as always you can see her great photos and insights at Blue Sky. I remember when I discovered the sheer pleasure of riding a boogie board in California. Z. made this same discovery and has insisted that her day be filled with time in the ocean everyday- no matter how sunburned she was. There doesn't seem to be much point in washing her hair because she will just end up back in the ocean with sand crusted onto her hair. Our first day in Hawaii the kids indulged in lots of sand castle building time and did a little swimming in a lagoon area. The next it was clear that their skin needed more than just sunscreen. Within a few days they both had long sleeved swim shirts and a new array of sunblock. The beaches are beautiful and even though I'm not able to do all the usual adventure stuff- hiking and lots of ocean swimming- I'm enjoying the sunshine and ocean and a comfy place to read. Today I drove by the beach where my wife was, and I hung my head out the window and whistled at her. But she didn't hear me. The person who did hear me was the beefy guy facing the street, who was getting his muscles oiled up by his little girlfriend. He was not pleased with my whistling. He stared me down and watched as I drove away. Here's me boogie boarding at Poipu Beach yesterday. I'm planning to go again today. While I was further out a giant sea turtle came up to investigate and waved a big leathery fin at me. It was about ten feet away, which was cool. The kids had fun, too, though they eventually gave up after multiple dunkings. 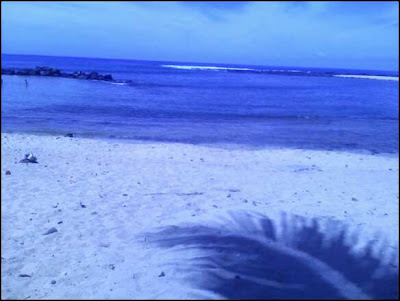 If you look at the picture below you can see A on the left, smiling and laughing at a brownish lump in the surf toward the right side of the picture. That would be the top of Z's head. Here's a picture of Z's hair after being rubbed several times into the ocean floor yesterday morning. But as you can see she was still having fun. I got bounced pretty hard a couple times myself... I went out further after the kids gave up. One time a really huge wave was right on top of me and I couldn't decide whether to go for it or go over it and then it broke right on top of my head. It was like getting a trip to the chiropractor and using a netti pot all at once. It was a lot of fun. Anyway, I should get off the internet and go do something on the beach. Later! This is a picture from under my palm tree on Poipu Beach. You can see a shadow from one of the fronds of my palm tree. You can see the ocean immediately in front of my palm tree. You might think that this picture looks overly blue, but I assure you it is, in fact, not blue enough. You may also notice that the horizon looks skewed to one side and think, that place does not look so great, it looks like it is tipped over and the ocean is going to run off to the side. This is, in fact, an optical illusion caused by the fact that I am sitting so lazily in my beach chair that I cannot be bothered to hold my cell phone straight long enough to snap a picture. Besides, I don't want to have to put my book down. In other news, I am renting out week-long shifts under my palm tree for a paltry sum. You can go to a cheap luau if you agree to sit with me for 90 minutes and let me try to sell it to you. We're in Hawaii and having a good time. Today we decided it was time to introduce the kids to boogie boarding. I rented two boards, one with a hard bottom and one that is basically just a slab of foam. The kids, of course, started to immediately fight over them before they even got to the water, the deciding factor being... the colors. Me: Let's get them down to the water and you can both try them out and decide which one you think is the most fun. Z: I want to see which one is easiest. Me: Easiest? Wouldn't you rather find out which one was the most fun even if it was a little more work? A: I WANT THE ONE THAT'S THE MOST FUN! News from my neighborhood: THE STREETS OF LIZARDO! Walking the kids home from school today we realized that as people rounded the front edge of our lawn they would give out a high pitched cry of alarm. This is because the foot-long reptile at left had cozied up into the daisys and would poke his creepy bearded head out as people walked by. Of course the neighborhood banded together and honorary neighbor Ken The Conquerer documented the capture of the lizard here on video . It's well worth your time to see our neighbor April, who was right in the middle of dieing her hair, show up and catch the lizard single-handedly. Z said she would name it "Freak." But when the owner eventually showed up he said the real name was "Dynamite." About an hour after the owner recovered the lizard he showed up again asking if we had seen it. I'm so glad we returned the lizard to the idiotic owner instead of taking it to animal control as had been the original plan. On a whim I decided a few moments ago to randomly type in a web address and see where it took me. I started with "boring.com." I didn't know what I would find. I thought, it could be something wonderful. Maybe someone made a sort of playground on the internet and named it "Boring" so only the odd occasional wanderer like myself would come and visit. That's the home of Boring Business Systems. So, since that's probably someone's last name I won't make fun of it. Because, as my boss Keith says, "People with names like ours should not make fun of the names of others." Excellent advice, Mr. Bubalo. Buuuuut, excited by the possibilities of typing in something strange and finding a wonderful new something, I decided to try again. So I went to lame.org and I discovered something mysterious. There's noting to see here. Your connection has been logged. Notice the grey, almost faded font. Also notice the word "nothing" has been misspelled... as if to say that there actually IS something to see here. And then the threat that my connection has been logged. I think that there is more to explore here. I've never been great at these internet games. I did click around on the page trying to see if there was a hidden link but I couldn't find one. Somebody smart go figure it out and then give me all the credit. GET TO WORK, MINIONS! Also, please make up some domain names, try them out and let me know if you come across any interesting ones in your internet spelunking. I heard a rumor about myself yesterday from a friend. It went like this: "Someone told me that you were asked to write for a television show." Me: That's not exactly true. Friend: I heard it was for 'The Office." Me: That's not true at all. Here's the story that this rumor is probably based off of... when I was in college one of my professors in a screenwriting class was a well-respected television writer. She really liked my writing and a script I was working on for her class and she thought that she might be able to get me a job. She said there was this new television show coming out that was looking for young writers and I might be a good fit for it. Professor: I think I can get you a job with this new television show. Prof: It's a show based on a movie. Prof: It was called Buffy the Vampire Slayer. Me: HA HA HA! That was a terrible movie! Prof (offended): I don't have to get you a job. Me: No way! I will write for any show! I finished the script as my prof requested and sent it to her and never heard from her again. I always assumed this was because I broke the Hollywood rule of never badmouthing the work of someone else because you might work with them in the future (I didn't know, I swear). It wouldn't be the first time that my Big Mouth got me in trouble. On the other hand, in retrospect, it may have been that the script I sent just wasn't very good. I try not to think about that. Weeds. Pretty soon we're going on vacation, and when we get home I leave in a matter of days for a work trip. I told Krista I would work for her today doing whatever chores were most important, so I spent a large portion of today weeding our garden. One thought that came up several times was THANKS A LOT, ADAM! We really appreciate you providing weeds for us. Not that I would have done better, I'm sure. But I have my least charitable thoughts about you, Father Adam, when I am weeding. Especially when I am trying to carefully hand-pick those little weeds that have the explosive seeds that when you touch the weed they leap off like monstrous fleas and hit you in the face or burrow into the soil and then send out their tiny little maniacal laughs. Words Kids Love But Don't Understand. I've been teaching the kids new words I think are useful for them. For instance, A was pleased to learn the word risible, and it's a word that is often useful for her. The one word my kids use multiple times a day but seem not to understand is the word "fair." For instance, A told me today that it was not fair that she has to use a car seat but that her older sister doesn't. I explained that it was, in fact, fair because when she reached Z's age, she, too, would be allowed to do away with her booster seat. I asked her if it was fair that Z was at school and she wasn't. I asked her if it was fair that we were going to the grocery store and she was going to get a cookie. Then she started laughing like crazy. I personally think it's not fair of an adult to use their superior intellect and reasoning against a child like that, don't you agree? I think I have a future in ornithology. I love it when the birds start returning to our neighborhood. We've been getting a lot of new birds at our feeder this year, and a good number of our old friends from last year, including a big bunch of yellow warblers. Today this black bird with red wings came to our back yard to say conk-a-lee! It seemed to have a message just for me. I wondered what sort of bird it was. Maybe a scarlet banded conkalee. Or a Crimson Midnight. Or an ebony feathered garnet winged backyard bird. So I decided to look it up. And, as it turns out, that black bird with the red wings is called... a red winged black bird. I am never looking up a bird's name again. What's that bird? Oh, that's a little brown speckled bird. Earlier this week I finished chapter five of the book I'm currently writing. 8022 / 60000 words. 13% done! I haven't been able to work on it much this week, which was disappointing because I am enjoying it. But as you noticed I haven't been blogging much, either. I've been busy. Also sick. Cough, cough. Hey, you know the rules... send me a book and I'll put it up on the blog. As it happens, I just received a book by a former atheist, and those of you who know me well know that I have a special affection for both atheists and anarchists. They're cute! 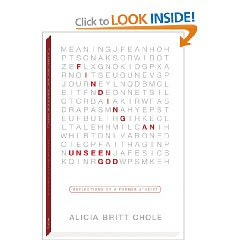 The fine folk at Bethany House just sent me a copy of Finding an Unseen God: Reflections of a Former Atheist by Alicia Britt Chole. 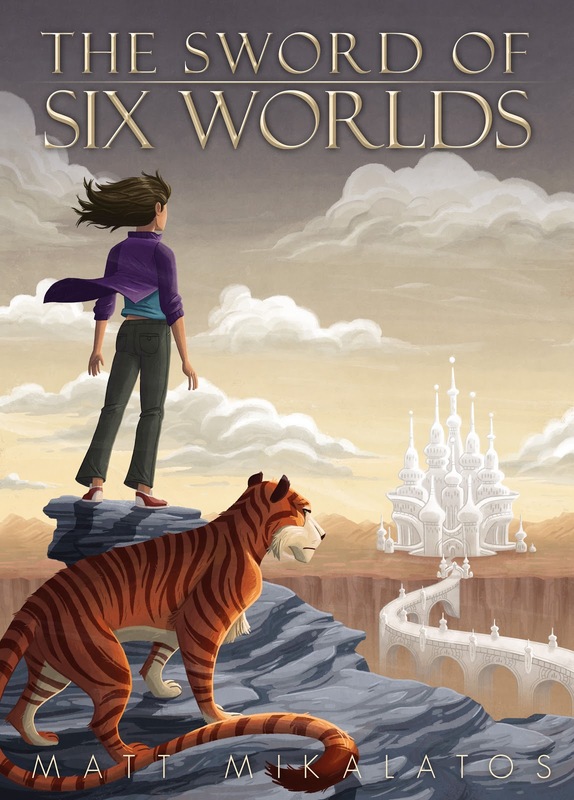 Here's a link to Alicia's blog, and here's a pdf where she answers some questions about the book. In any case, the book looks interesting... it starts with chapter 52 and is followed by chapter 1 and then the chapters continue to move toward the middle. I usually enjoy books that mess around a bit like that. I'll let you know once I read the book, but wanted to let you know what's on the bookshelf. Merry Christmas! Yay! More Books! We got a package from Amazon yesterday with Krista's name on it. We shook it around for a while and couldn't remember ordering any books. 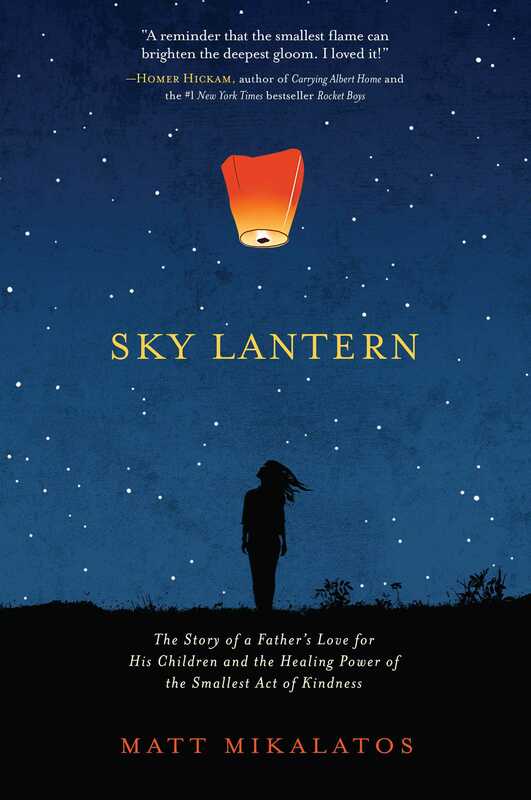 Then KAPOW we remembered that Krista had ordered me a book for Christmas... a book that hadn't been published yet. But -- it's a book I've been eagerly waiting for by Glen David Gold, the author of Carter Beats the Devil , one of my absolute favorite books of the last few years. I think I've bought three or four copies of it. Anyway, Gold's new book, Sunnyside , just came out and since Krista had ordered it for me it just arrived! I am really excited to read this book. Excited enough that I think I'm going to save it... I have a couple of busy weeks coming up and then a quick vacation with the family. I think this will be my vacation book! Yeeha! And, as an added bonus, because Amazon sends things in groups to save on shipping, I also got a new John MacDonald book, Bright Orange for the Shroud . The MacDonald Travis McGee books are always a solid treat. So, the moral of this story is that books are good. We need more books. We watched part of a documentary on James Dean last night. It mentioned that one of the three films that James Dean starred in before his death was an adaptation of Steinbeck's East of Eden... one of my favorite novels of all time. A lot of people are disturbed by the dark themes in the book, but I find it a fascinating and beautiful re-telling of the story of humanity's Fall. Krista knows the book is my favorite (I've read it at least once a year since she originally forced me to read it). So she suggested, "You should add that to our Netflix cue." "That would be fun," I said. "I'll do it." "Oh, I'm sure that will be fun," she said. Implying, of course, that the content of the story is not something most people would describe as a joyride of free hilarity. "Now you're just making fun of me," I said. I'm glad you're home, Krista. I missed you! I don't know if that's the right way to spell it, but babbafay is the most common word in A's nonsense language, which is called "A Language." I asked her what it meant today and she told me that it means I Love You or Potty Monster depending on the day. Another popular word is guavafay but she has never revealed the meaning of that. I thought she would enjoy hearing a poem with a lot of nonsense in it so I started quoting Carroll's "The Jabberwocky" to her--Twas brillig and the slithy toves did gyre and gimble in the wabe--you know all that. A told me that she thought it would be a nonsense poem and that she understood too many words. Me: Hey. Be careful, you might accidentally call him a potty monster. Me: Now eat your dinner. This last weekend was Free Comic Book Day... my kids got an Archie comic and liked it so much that I decided to go back and look around and see if I could find another one for them. What I found was an old Spire Comics "Christian" Archie comic called Archie's Sonshine. Of course the kids love it. 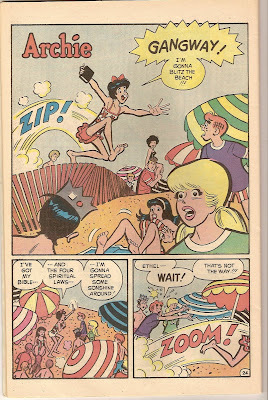 Archie isn't thrilled about that way of doing things, but Betty says there's nothing wrong with it. 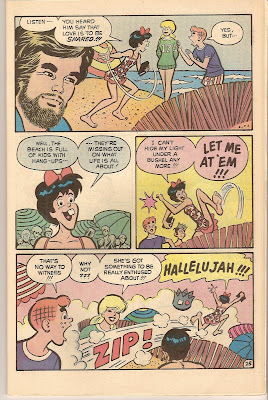 Notice also the cameo of the swinging, bearded hep cat who shows up on the beach in his van to tell all the kids about God (you can see what he looks like in the top panel of the page below). In the end, I thought this was a funny little reminder of how present Campus Crusade for Christ was in the mainstream Christian culture in the 1970s. I'm guessing it has been a long time since a CCC tool was referenced in a comic book... this one is from 1974, the year I was born! Anyway, enjoy (if you click on the pages you can see them larger). If you want to see full Spire Comics that have been scanned in, check out this page. So. Tired. It's hard being Mr. Mom. Not as hard as being an actual Mom, I'm sure. For instance, I fed the kids a frozen pizza for dinner. I only made one of them take a bath. I told them they could play with knives. I told them they had to brush at least half their teeth. All that to say, I didn't feel like writing tonight. But then I did write, and I had fun. I type too fast when I'm writing, which means I get a lot of hard-to-catch typos where I type real words in the wrong place. And then there's the weird phenomenon that I always want to write the word "both" with an "e" on the end. This happens bothe when I am writing and when I am typing. It doesn't look weird to me... it looks right. Not sure why that is. Anyway, wrote through chapter four tonight which brings me to the first milestone that counts... TEN PERCENT! YAY! Just do that nine more times and it's done (he says to himself, as if giving a pep talk). 6432 / 60000 words. 11% done! In other news, it is raining a lot. Krista's away on a wives' retreat with other CCC wives tonight and tomorrow night. Usually this means that I rent crappy movies, feed the kids crappy food, and do my best to explore mindless entertainments too "low brow" for my wife. Tonight I had decided to watch "Shawn of the Dead" because it is something Krista will never, ever watch and I thought it might be fun. But then I thought that instead I would work on a new book. I finished my previous book a while ago and my agent has been shopping it around. I'm certain that if anyone ends up publishing it that there will be plenty of work yet to do on it, but last weekend a new idea for a book jumped into my brain and has been carving out a little cave for itself in my thought life. When this happens to me I don't usually get much rest from the incessant nagging in my brain until I finish it... so I thought I'd go ahead and use tonight for something a little more productive. I wrote the first chapter late last weekend and wrote chapter two tonight. I've got three all blocked out, and a solid idea of the overall plot, though it's not a beat sheet by any stretch of the imagination. And I have a title I really like, but you'll have to wait a while for that. I want to savor it for a little while. Anyway, my friend Adrian sent me an email a long time ago about how I should be reading the comic "The Immortal Iron Fist" so when the local comic book shop had a big sale this weekend I bought a big stack of them and have been enjoying them. So I'm off to bed RIGHT NOW to enjoy one more ish of Iron Fist before sleepy time. 3543 / 60000 words. 6% done! Six percent. Wow. I feel like I've accomplished something now. <--- that's sarcasm for all of you out there with busted sarcasm sensors. News From My Neighborhood: Cats Aflame! I've written more than once about Gemma, the miniature tiger who lives next door. She has a new litter of kittens. She's been hiding them around the neighbor's house. She doesn't like anyone to look at them. She moves them if they're found. The little girl next door (D) came over and knocked on the door this week, looking for Z and A. Gemma followed her over, looking like she was ready to pounce on something. I pointed her out and D said, "She's a Russian cat." My neighbor to the North, Derek, and I were talking about Gemma yesterday. She has a little bit of a reputation in the neighborhood because of the fact that this is her second litter of kittens and no one knows who the Father is. Also, she walks through everyone's yards with an expectation of impunity. And she smokes the discarded cigarettes around the neighborhood. And she eats our frogs. And I caught her in the plum tree trying to eat our birds. Do they not feed her? Good grief. Anyway, Derek and I were trading Gemma stories and then Derek said that he had seen our neighbor to the West (they of the fake dogs and the hate mail) driving toward home as Gemma was crossing the street. Suddenly, he swerved the car toward her. Derek claims he drove up onto the sidewalk attempting to hit her! Of course she evaded him. Then he got out of his car calmly and looked around to make sure no one had seen him. He better watch his back now. Gemma will be waiting for him, crouched in the bushes of his back yard. Where there's Smoke there's A Fire Truck. Krsita called me upstairs last night to tell me that I was missing "something dramatic" in the neighborhood. Someone to the NW needed a fire truck. The first drama was the fire truck trying to squeeze past the corner where our house is... gets pretty narrow with all the cars parked out there. As we watched, the firemen started exploring the neighbor's garage with flashlights. They did this for a long time. They evacuated the house. No cops came, so we don't think it was anything illegal... but soon the firemen were tromping all through the house with flashlights. This went on long enough that we got bored of trying to figure it out and went to bed. THEN THE HOUSE EXPLODED! Just kidding. Lots of birds this season. We even had a flicker in the back yard this week! It's a pretty large type of woodpecker. It mostly ate bugs out of the grass. Neat. 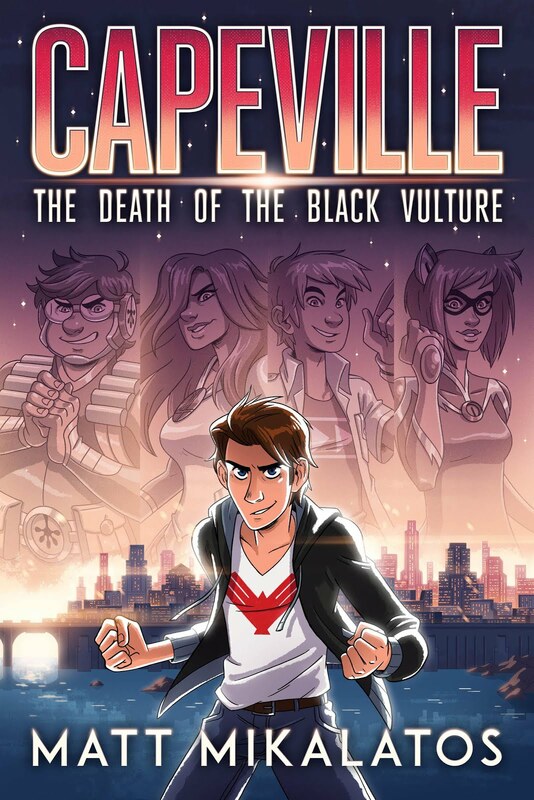 Don't forget that this weekend is free comic book day! If you live in Portland or Vancouver, here are some stores near you that will have free comics available. If you have some free time and you want to go see some beautiful watercolors by our most infamous friend, The Omnivore, then you need to head to the beach tomorrow. Here's a news article about the show.